The production of cellulases and of xylanase by Streptomyces lividans 1326 was studied under different growth conditions. The strain grew between 18°C and 46°C and is therefore thermotolerant. Submerged cultures of the microorganism, when grown on a defined salt medium containing xylan as main carbon source, exhibited an overall cellulolytic activity as determined by the filter paper test. S. lividans produced optimal levels of extracellular β-1,4-glucan-glucanohydrolase (1 IU/ml) and large amounts of β-1,4-xylanxylanohydrolase (50 IU/ml) at 40°C. A better production of both enzymes was observed when xylan instead of cellulose was used as substrate. 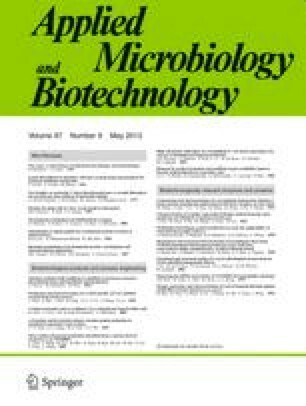 The stability of the enzyme was found to be significantly greater than those of the cellulases and xylanases produced by other streptomycetes. The optimal incubation temperatures for the enzyme assays were 55°C and 60°C for CM-cellulase and xylanase respectively and optimal pH values were found in the range of pH 6–7.